Editor’s note: Below is the letter Mike Glasser, president of the New Orleans Police Association, sent to scores of people at The Times-Picayune newspaper, followed by the response from Rich Roberts, Public Information Officer for the International Union of Police Associations (IUPA). If you or your agency or association responded to the outrageous denigration of police officers everywhere, please send it along so we can share it. My name is Mike Glasser. I am the president of the Police Association of New Orleans (PANO) which represents sworn personnel of the New Orleans Police Department. By now, you’ve no doubt come to understand how offensive it was to publish Mike Luckovich’s cartoon as businesses having contracts with your publication continue to cancel their advertising campaigns. I’m incredibly humbled by the support our business community has shown to all the New Orleans police officers but I was not surprised as the community has always been our most fervent ally when we serve them honorably. 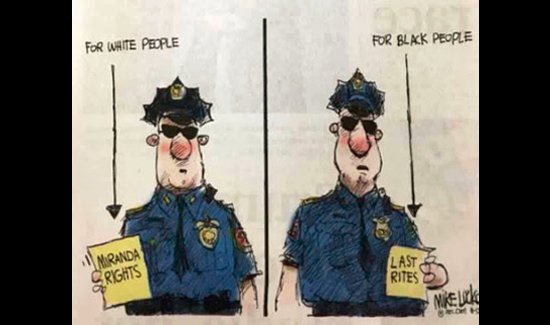 Your recent editorials and this hideous cartoon makes evident that you do not understand the relationship that the NOPD enjoys with its community. My dismay at seeing that cartoon was exceeded only by the “retraction” that was published afterwards. Rather than apologize for the content, which is why you’re losing your business support, you chose to regret only your timing. And while I appreciate your recognition of Louisiana’s first responders’ diligence and heroism, your “timing” explanation implies that after this disaster passes, you expect the police to go back to the kinds of practices implied in the cartoon. This response is hollow, vapid, and designed only to try to salvage what’s left of your economic support without admitting your profound mistake in printing this cartoon. Mark Twain said, “Never pick a fight with people who buy ink by the barrel.” Well the Internet and social media have given us all barrels of ink. I hope and believe this entire affair will result as a rallying point for our community to reaffirm their relationship with those who are sworn to serve and protect them. Editor’s note: After American Police Beat sent this story out to over 15,000 law enforcement people from the U.S. and Canada, including over 600 law enforcement association and union leaders, the International Union of Police Associations went above and beyond to spread the word. Below is a note Mike Glasser received from Rich Roberts, the IUPA Director of Public Affairs. To Captain Glasser: After Cynthia Brown, the Publisher of American Police Beat magazine sent me your Facebook posting “Local Newspaper Slanders Law Enforcement,” I wanted you to know that the I.U.P.A. sent this information out to 30 law enforcement publications, 25 labor magazines, and 25 national media outlets. In addition, I sent it to 30 personal contacts including my old gun club, the 12th Precinct Pistol Club formed by officers from the 12th Precinct of the Washington DC Metropolitan Police Dept. Our membership includes a number of police officers as well as pro-police civilians. The I.U.P.A. is also doing an e-blast to our entire membership throughout the country potentially reaching as many as 100,000 officers, placing it on our own Facebook page, and our web site. It was Tuesday’s lead story on I.U.P.A. NewsWatch which is a compendium of key stories we send to our officers on a weekly basis. Finally, Bill Erfurth, founder of the website Heroes Behind the Badge, will also put it on his Facebook page. According to Bill, he reaches as many as one million viewers. You can read more about this on Mike Glasser’s Facebook page. If you want to contact any of the people involved with printing this cartoon, the list is below.